The Vespa event of 2016. “70 Years of the Vespa”, the International Meeting The Pontedera Vespa Club, with the patronage of the Municipality of Pontedera, the Motor City, is organizing the birthday party for the Queen of the Scooter. Club, Vespa drivers and fans from all over the world to celebrate a success story of Made in Italy. Many events connected to each other, from tours to concerts, from exhibitions to the competitions: a rich, crackling program live from inside the Mito Vespa, in the land that gave birth, in the workshops in which the invention of D’Ascanio has taken its first kilometers. Vespa, art, culture, landscape. For participants, a unique chance to live some of the most evocative of Tuscany – the splendid Tuscan landscape offered by the Pisan Hills, the picturesque medieval villages of the Valdera, the architectural jewels of City of Pisa – in a festive occasion that unites the passion of vespisti hosts of all ages and backgrounds. International Meeting “70 Years of the Vespa” will take place in Pontedera (PI), in the city that gave birth to the vehicle. The tour “Pisa and leaning Tower” will be reserved exclusively for Vespa riders who book visit to the Piaggio plant in groups of hours 9:00, 10:00, 11:00 and 12:00. 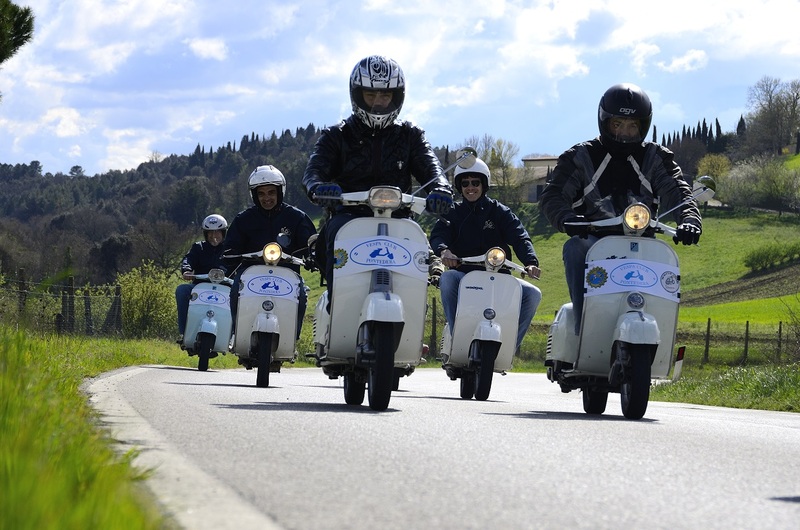 The tour “Valdera Toscana Hills nr.1” will be reserved exclusively for Vespa riders who book visit to the Piaggio plant in groups of hours 16:00 e 17:00. Tour “Valdera Toscana Hills n.2” delle ore 9:30 will be reserved exclusively for Vespa riders who book visit to the Piaggio Museum in groups of hours 14:30, 15:00, 15:30, 16:00 e 16:30. Tour “Valdera Toscana Hills n.2” delle ore 14:00 will be reserved exclusively for Vespa riders who book visit to the Piaggio Museum in groups of hours 9:30, 10:00, 10:30, 11:00, 11:30, 12:00 e 12:30.